This morning in St. Francisville Judge Carmichael of West Feliciana Parish’s 20th Judicial District Court made the first determinations about what the legal landscape will look like if Judge Brady’s “unconditional Writ” is overturned and Albert faces a third trial. The good news is that the judge agreed to require a unanimous jury decision, to allow DNA testing of all evidence still in the State’s possession that may contain adequate sample sizes for modern analysis, and to give Albert’s defense team access to any fingerprint files the State possesses from Angola at the time of the murder. He also agreed to give Albert’s defense team a chance to privately review (under seal) letters from the latest grand jury foreperson expressing “serious misgivings” about the “process” in order to assess whether or not the most recent indictment itself, hastily obtained in February of 2015 before the federal appeals process had fully played out, may have once again been improperly obtained. Overall though, it was not a good day for Albert, or for justice, in St. Francisville. In a curt, 45 minute hearing (originally scheduled for two full days) the judge rejected a solid majority of Albert’s 16 pre-trial motions designed to create a fair evidentiary and procedural playing field for any potential retrial. Albert’s motion to quash, change the venue, and run the print evidence through the FBI’s expanded AFIS database were all quite unceremoniously denied. Critically, so were Albert’s requests to exclude all the now impeached, debunked, and discredited testimony presented at previous trials by Hezekiah Brown and the State’s other key witnesses. Though Albert will be allowed to present impeachment evidence to a new jury, the jurors will never able to see how these now deceased witnesses respond and react on the stand when confronted with their own lies, obfuscations, and omissions from previous testimony. We remain confident that the evidence of innocence is so overwhelming that even on an unfair playing field, Albert will prevail. But today’s proceedings were a sobering reminder that his battle for justice is not yet over, and will most certainly be uphill. We will keep you updated as the pretrial preparation on both sides moves forward throughout the fall. 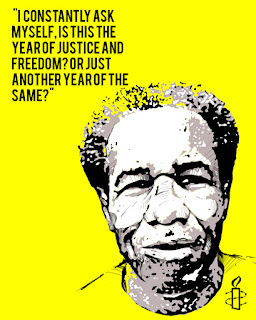 Featured below, reprinted in full is a statement released by Amnesty International USA following Albert Woodfox’s hearing this morning in Louisiana State Court. 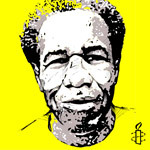 Today, Judge William G. Carmichael of Louisiana’s 20th Judicial District Court held a hearing to lay the groundwork for a possible third trial of Albert Woodfox, the last imprisoned member of the Angola 3. In June, U.S. District Judge James Brady ordered Woodfox’s unconditional release, overturning his conviction and barring the state from retrying him, but the state of Louisiana appealed the ruling. While the appeal is being considered, the state court is moving ahead with a new trial. 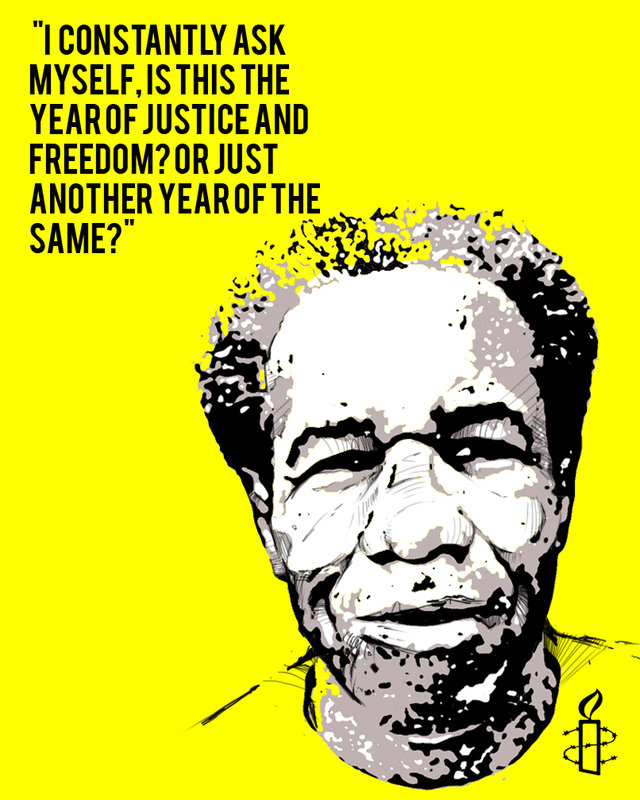 “Albert Woodfox has endured over four decades in a cell the size of a parking space. His conviction has been thrown out three occasions. But each time his freedom has seemed within reach, the state of Louisiana has done everything in its power to keep him incarcerated. “Woodfox was moved to solitary confinement before ever being convicted of murder. He has stayed there for four decades, through three overturned convictions, fighting to prove his innocence. Albert Woodfox’s case serves as a harsh condemnation of the U.S. justice system; he remains trapped in both a cell the size of a parking space and in a legal process tainted by racial discrimination, among other glaring flaws. Through all of this, the warden of Angola prison has continued to justify his ongoing isolation based on Woodfox’s association with the Black Panther Party. “I don’t know of any place in the world where people are held in solitary confinement for over three decades—that is cruel and unusual punishment if there is ever any accurate use of that term."